As of the census  of 2000, there were 1,037,831 people, 397,303 households, and 262,131 families residing within the MSA. The racial makeup of the MSA was 83.35% White, 10.73% African American, 0.27% Native American, 1.90% Asian, 0.03% Pacific Islander, 1.99% from other races, and 1.73% from two or more races. Hispanic or Latino of any race were 4.50% of the population. The median income for a household in the MSA was $42,733, and the median income for a family was $50,687. Males had a median income of $36,777 versus $25,999 for females. The per capita income for the MSA was $19,626. The Rochester NY MSA is the third largest economy & the second wealthiest region in all of NYS after the NYC MSA. Components of the Rochester–Batavia–Seneca Falls combined statistical area. 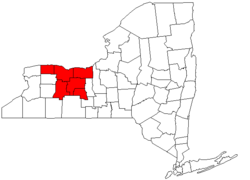 The Rochester– Batavia– Seneca Falls combined statistical area is made up of seven counties in western New York. The combined statistical area includes one metropolitan area and two micropolitan areas. As of the 2010 Census, the CSA had a population of 1,149,653. Together with Alfred State College, Alfred University, Corning Community College, Genesee Community College, Houghton College, Keuka College, and Wells College and New York Chiropractic College, all within 90 miles of Rochester, these institutions comprise the Rochester Area Colleges consortium. The Rochester Institute of Technology (RIT) was founded in 1829 and is the tenth largest private university in the country in terms of full-time students. It is internationally known for its science, computer, engineering, and art programs, as well as for the National Technical Institute for the Deaf, a leading deaf-education institution. ^ a b "2010 Census Data". Retrieved July 25, 2012. ^ "Rochester, NY MSA Population and Components of Change". U.S. Bureau of Census and Real Estate Center at Texas A&M University. 2010. Retrieved July 25, 2012. ^ Dougherty, Nate (September 8, 2010). "Rochester ranks as No. 8 best college town". Rochester Business Journal. Rochester, New York. Archived from the original on September 8, 2010. Retrieved September 8, 2010. ^ Goodman, James (September 9, 2010). "Area ranks high for colleges". Democrat and Chronicle. Rochester, New York. Gannett Company. pp. 1A, 8A. Archived from the original on September 9, 2010. Retrieved September 9, 2010. ^ Gardner, Kent; Sittig, Scott (April 2010), Economic Impact of University of Rochester and its Affiliates (PDF) (Report), Rochester, New York: Center for Governmental Research, p. i, retrieved December 22, 2011, The UR is clearly the leader in the transition of Rochester’s economy that is now driven by the education and health services sectors. ^ "America's 25 New Elite 'Ivies', August 21, 2008". Newsweek. August 30, 2007. Archived from the original on May 14, 2007. Retrieved August 30, 2007. Wikimedia Commons has media related to Rochester, New York metropolitan area.